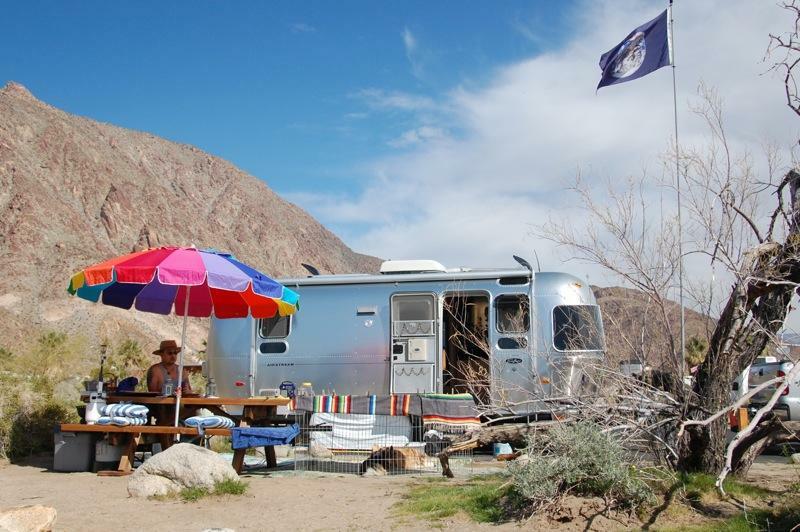 After a turbulent and stormy winter, we returned to the desert to see the beginning of the spring wildflower season in Borrego Springs, California. Snow could still be seen on a distant mountaintop as flowers bloomed after a series of desert rains. 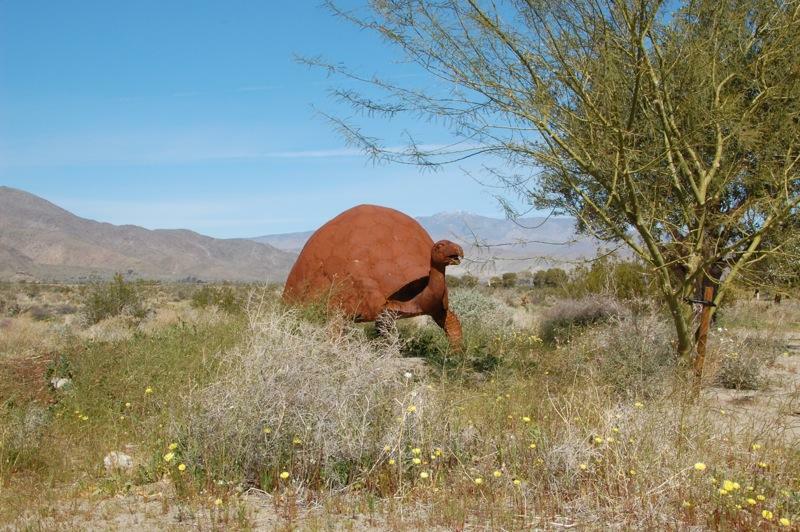 The tortoise seen above is one of many free standing, steel welded art structures created by artist/welder Ricardo Breceda for Dennis Avery, land owner of Galleta Meadows Estates in Borrego Springs. 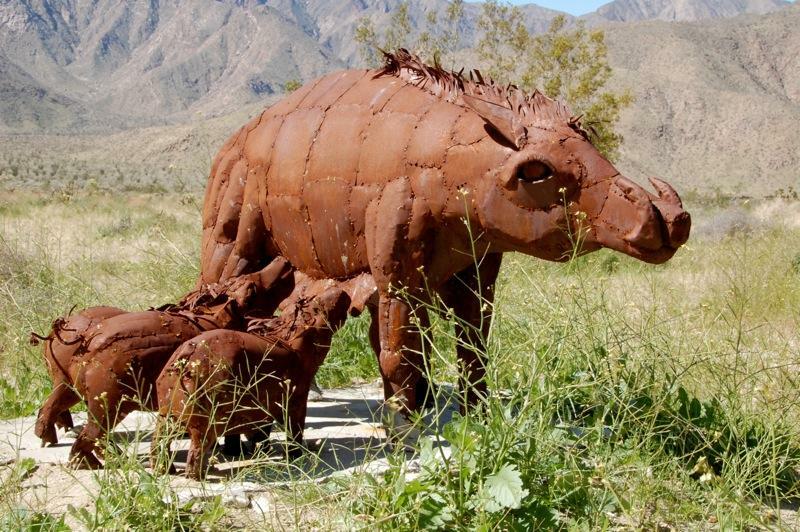 This ‘Sky Art’ depicts vertebrates of the past, which inhabited the Anza-Borrego region during the Pliocene-Pleistocene and Miocene eras. 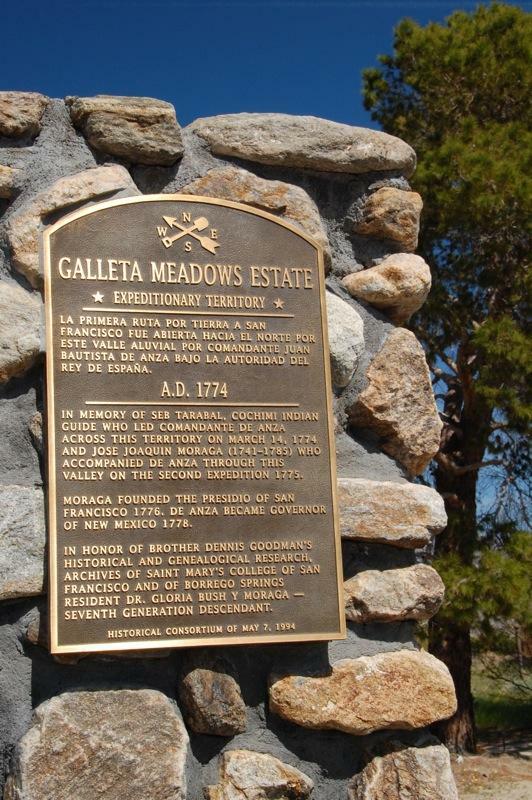 This Galleta Meadows Estate plaque points out the historic nature of this site in the area of the expeditionary territory through which the first overland route to San Francisco Bay was established by Juan Bautista de Anza with the help of Cochimí Indian guide, Sebastián Tarabal, on March 14, 1774. 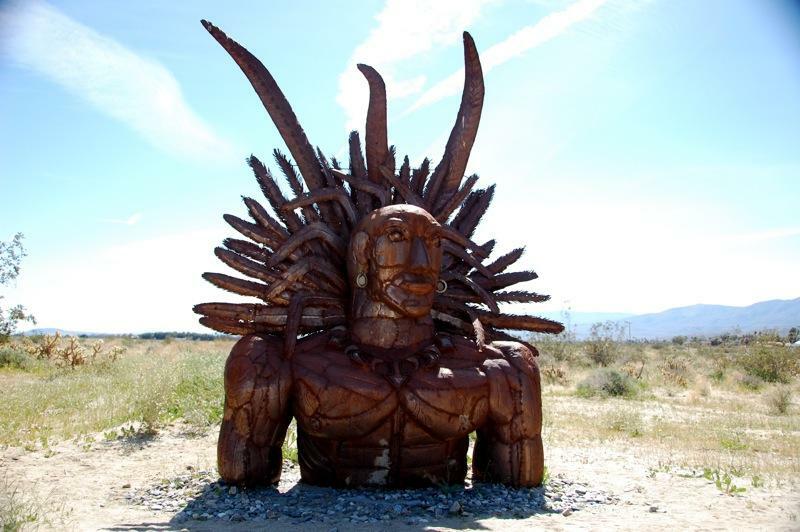 An Indian chief, friar and farm workers are also represented in Breceda’s art structures. A wild pig and suckling piglets are seen standing and almost obscured by the non-native and invasive Sahara mustard (Brassica tournefortii). The Saharan Mustard is now destroying or inhibiting wildflowers in Anza-Borrego Desert State Park. Although plants in general are protected in Anza-Borrego Desert State Park, Anza-Borrego Foundation trains volunteers in the removal of the Saharan Mustard. We saw volunteers removing these plants from along Henderson Canyon Road and Borrego Palm Canyon areas. Without their efforts, the vast carpet of spring wildflowers typically seen in Henderson Canyon may disappear. 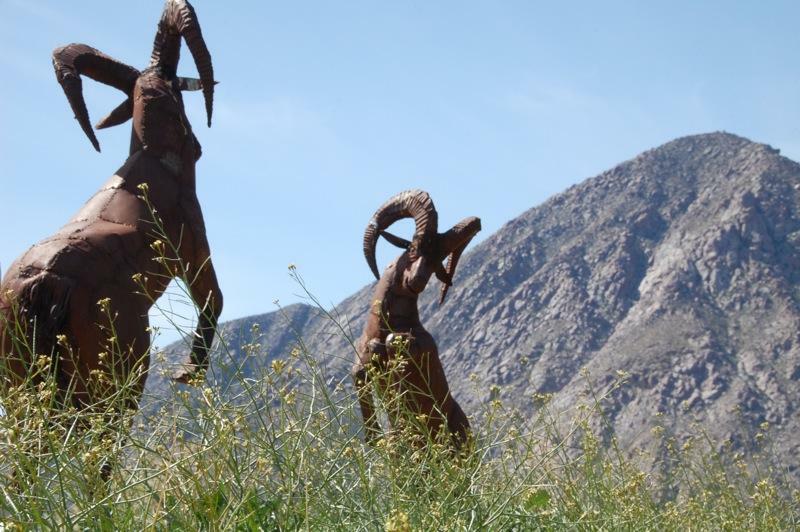 The Saharan Mustard is also invading Galleta Meadows and obscuring the art structures such as the Big Horn Sheep. 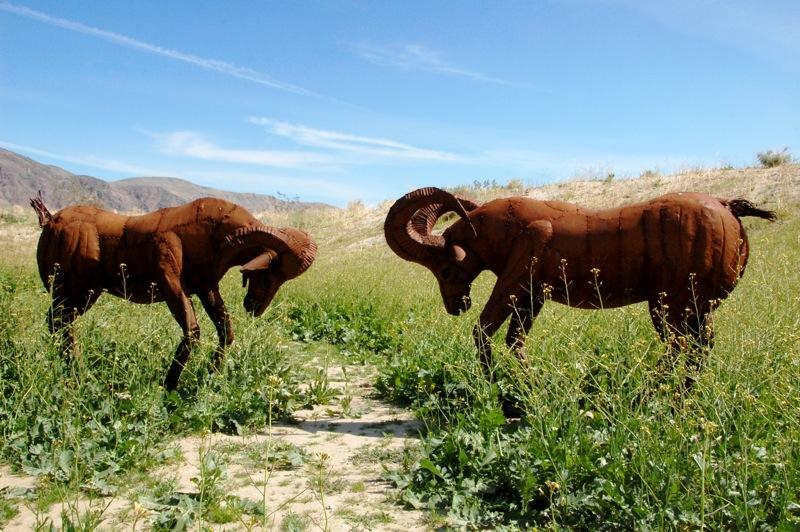 Rams clash as the battle of native and non-native plants looms. 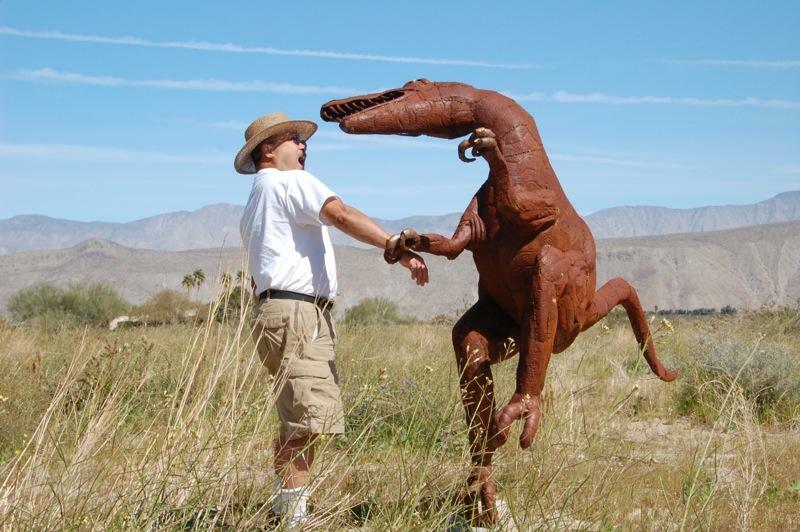 Larry was caught up in the action… and by this raptor. “I’ve Got a Crush on You” (… Tasha). Wildflowers, art, and dogs! Oh my! Wildflowers are beginning to make their appearance in Anza-Borrego Desert State Park and this year promises to be a great one because of the heavier then usual rainfall. With a little luck, warmth and sun, the wildflower displays should be spectacular. Although we did have one day of full sun last week in the desert, most days were partly sunny and cool breezes prevailed. 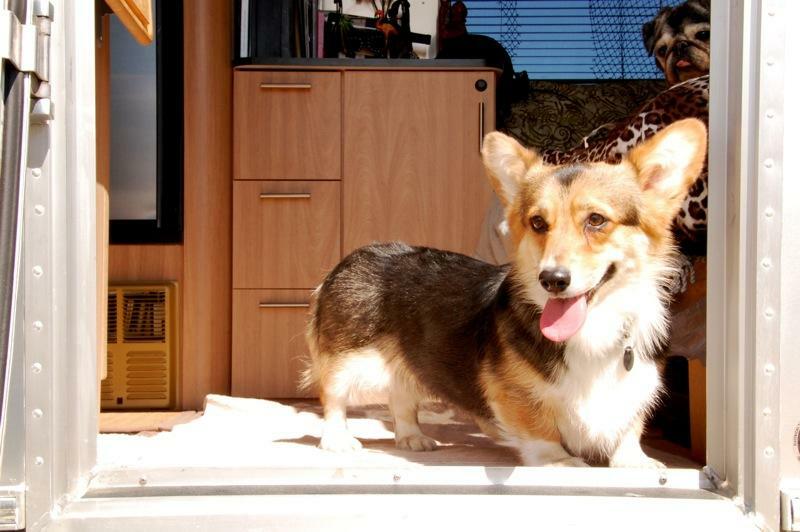 Our annual return for this event was even more special for us this time because we brought along a new member of the family, Tasha (short for Rosewood Montage), a Pembroke Welsh Corgi. We also brought along a new element for our setup, a dog pen (click on the above image for larger view). Advantages of using a dog pen are noted below. 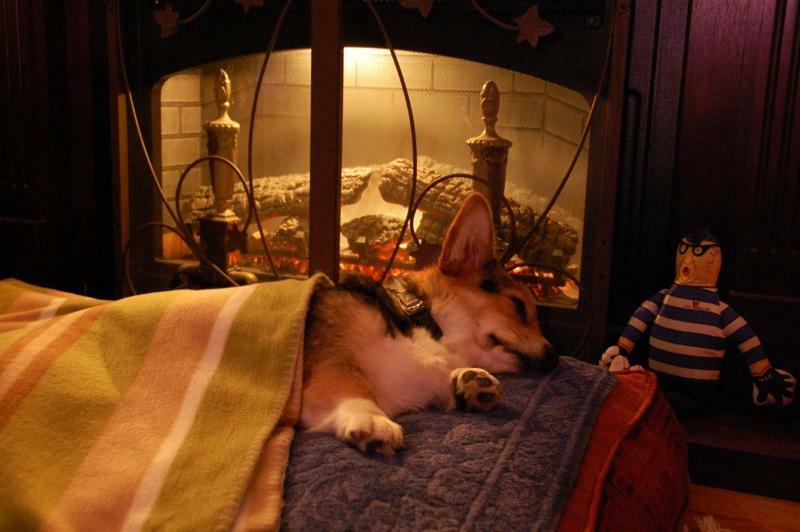 Tasha’s happy now, but when we returned home from our previous outing our local Corgi breeder, Liisa, told us that Tasha had just lost her first litter (via emergency C-section) and was depressed. Liisa had to be out of town for a few days and asked us if we could house her, and if it worked out, we would also have an option to buy her, which we did upon Liisa’s return. Tasha now brightens our days as we cope with the pending loss of our 15 year old Pug, Pau Hoa, who was diagnosed with a malignant mast cell tumor (She can be seen in the upper right corner of the above photo). 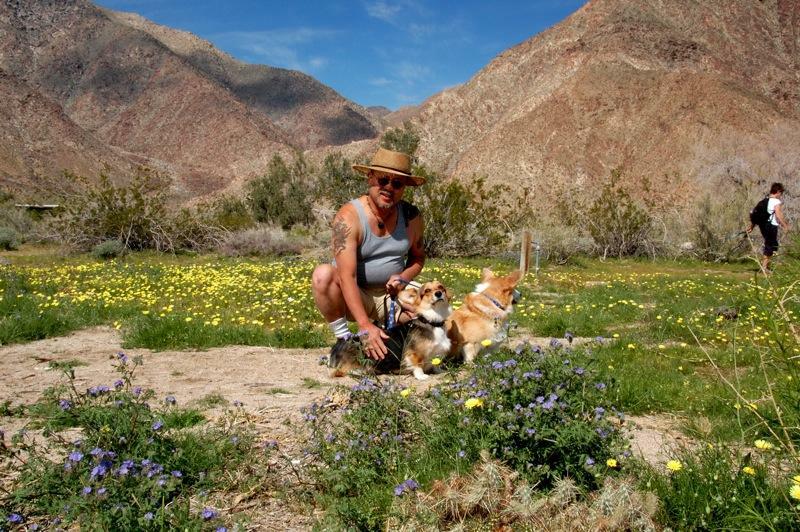 We all had a happy time walking in and around the wildflower displays in Palm Canyon Campground. 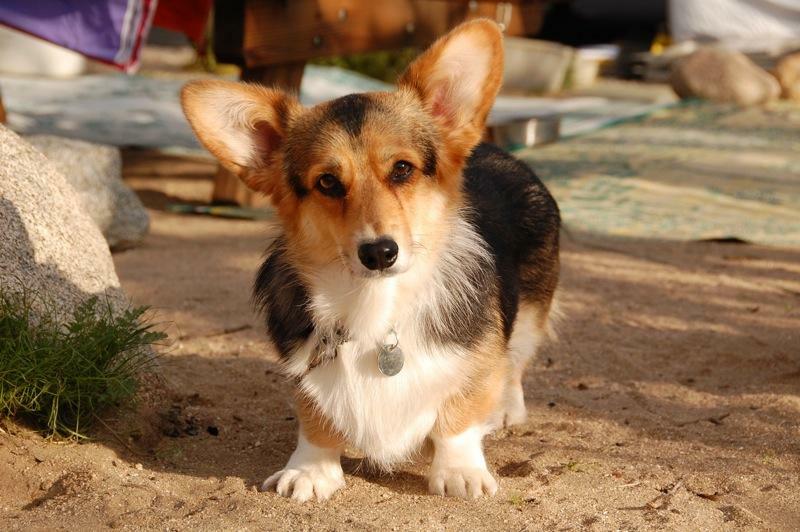 On Friday we loaded the Corgis into their carriers strapped to the back folded down seat of our F-250 truck (see Traveling and Pet Safety), positioned the Pug on a floor cushion under Larry’s legs and took off to visit the Farmers’ Market at the Borrego Springs Christmas Circle and enjoyed delicious tacos from Jilberto’s Taco Shop. 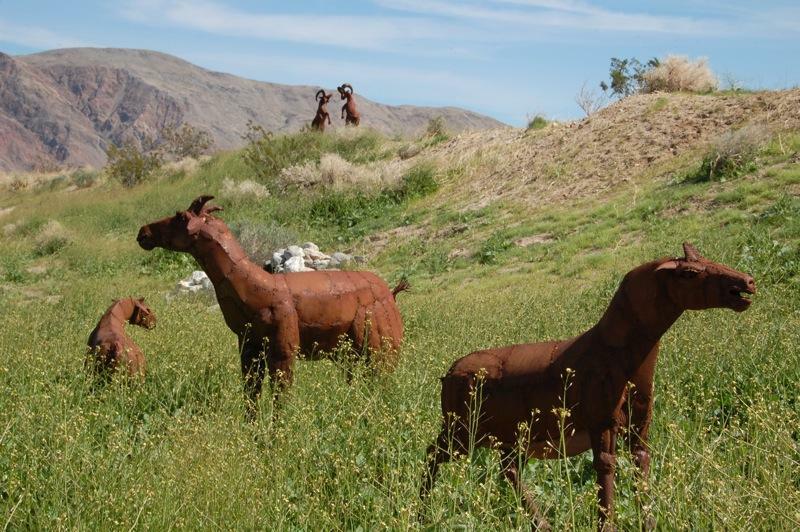 We then drove north on Borrego Springs Road exploring various parcels of the Galleta Meadows Estate displaying free-standing welded iron sculptures created by Ricardo Breceda. One such sculpture is a depiction of Father Hermenegildo Tomás Garcés (April 13,1738 – July 19, 1781) accompanied by his dog holding a bone. In 1768 Spanish Franciscan Garcés was assigned to Mission San Xavier del Bac near present day Tucson, Arizona. 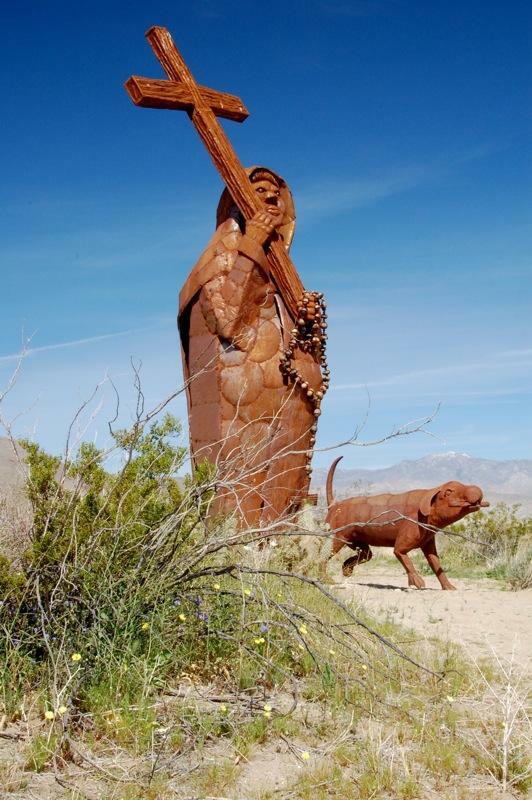 He conducted extensive explorations of the Southwest and assisted Juan Bautista de Anza in establishing an overland connection with New Spain through the region of the lower Colorado River. A sprinkling of wildflowers can be seen in the foreground, while snow is seen on the distant mountains in the background. After visiting and photographing other sculptures (which will appear in my next article), we returned to camp. 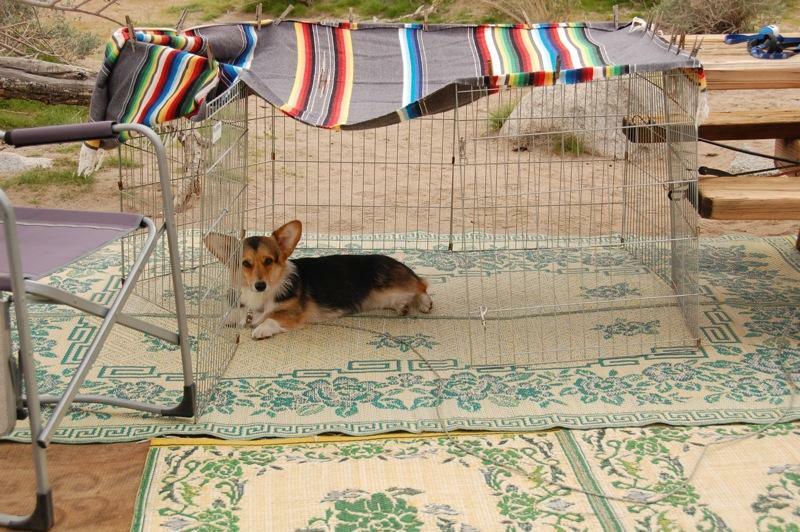 Below is a photo of our dog pen. We have discovered the benefits of dog pens in that they can provide a safe, secure, and shady place for our dogs and help us manage them during meal time. In this photo Tasha is on a runner and has chosen to enter the pen to relax. The pen is held in place with bungee cords attached to the table. 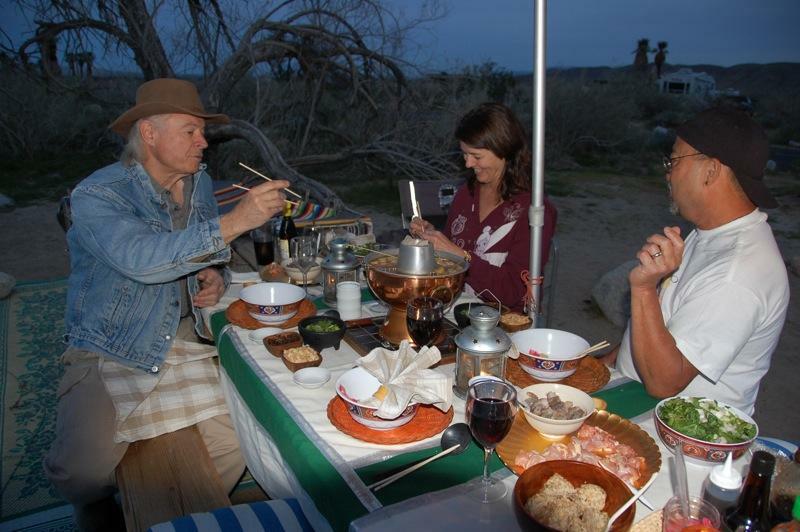 Bob and his wife, Theresa, joined us for a Chinese fire pot dinner. 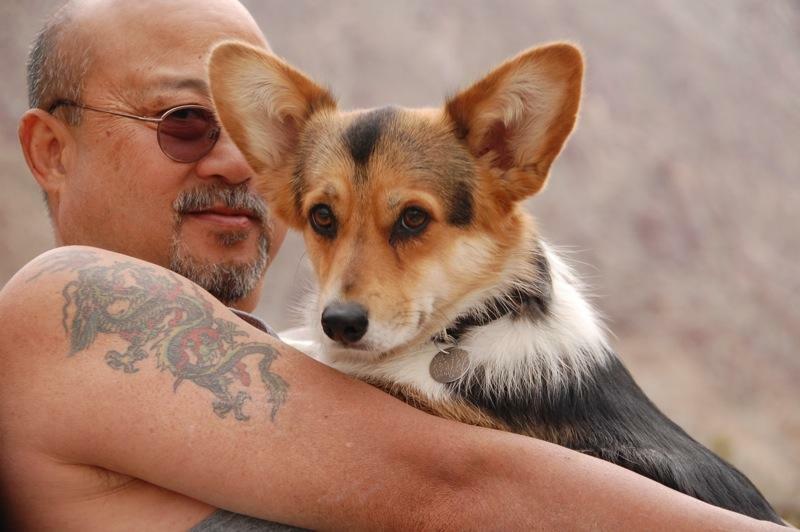 Bob is our veterinarian and has a 30′ Classic Airstream. Charcoal burns in the chimney of the fire pot/hot pot heating the soup and cooking the ingredients that guests place into the soup with a small wire basket. Noodles can be added to the soup as a last course. Tom Yum, a Thai kaffir lime chicken broth, was used as the soup and the following ingredients were provided: raw shrimp, sliced boneless skinless chicken thighs, cooked pork meat balls, bok choy, chopped cilantro, shredded Nori seaweed, and roasted peanuts. Guests chose from a variety of condiment sauces.